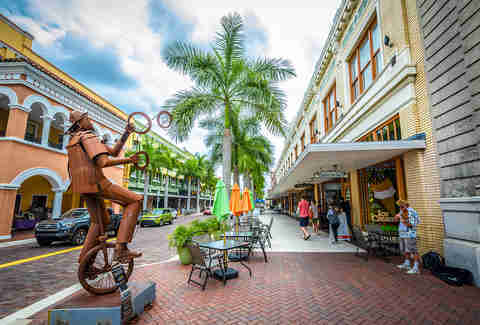 The Fort Myers River District has all of your downtown staples -- shops, bars, restaurants, you know the drill -- but it also happens to be a booming arts district. Join the monthly Art Walk and check out the 14 galleries that open their doors to visitors for self-guided tours and meet-the-artist receptions. Some are owned by local artists and feature everything from modern abstract paintings to whimsical sculpture work, while others offer constantly changing collections with everything from Florida landscape water colors to jewelry from local crafters. Hit them all in one night (because what’s hotter than being able to have an intelligent conversation about art?) and then rest your feet at the Wisteria Tea Room, serving English-style tea out of a bungalow, complete with scones, sandwiches, and mini desserts. It’s like a Jane Austen novel, but you get a beach instead of disapproving in-laws! Picture your classic ‘90s rom-com dream date: a sunset, a beach, and an acoustic guitar. During the week, the Fort Myers Beach Pier is used mostly by fishermen headed to the tackle shop, or sunset revelers strolling by after their visit to Fort Myers’ Time Square. While there isn’t much on the actual pier, it becomes a makeshift outdoor stage during the weekly sunset celebration, showcasing local musicians and performance artists. Before heading to the pier, be sure to hit up the Blowfish Bar next door for a happy hour cocktail right on the beach. 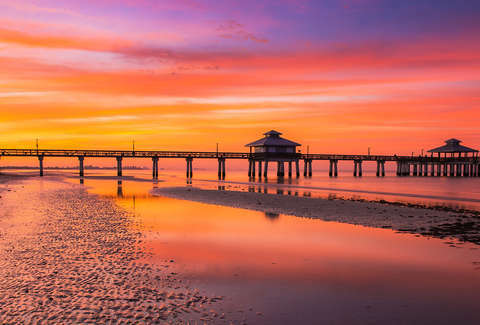 After a round of piña coladas, you can stroll to the end of the pier and watch the sunset from one of the most prime Fort Myers Beach locations. Don’t forget to tip the musicians -- maybe they’ll play “your” song. There are few things more romantic than butterflies fluttering around you. You’ll be in good company at The Butterfly Estates, where you’re greeted by tropical plants, benches, and, of course, butterflies upon walking into this 3,600 square foot greenhouse. But waiting for a native Florida butterfly (or 20) to land on you and say hello isn’t just dreamy, it’s also for science! 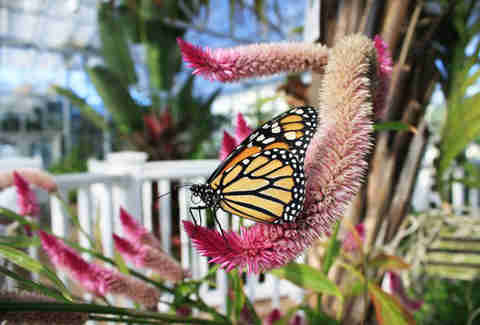 The estate is a nonprofit dedicated to conserving Florida’s native butterfly species and educating the public about their importance. Afterward, head to The Shops at Butterfly Estates, which include a book store, fudge shop, and ZCrepes Cafe, serving up French crepes, both sweet and savory. 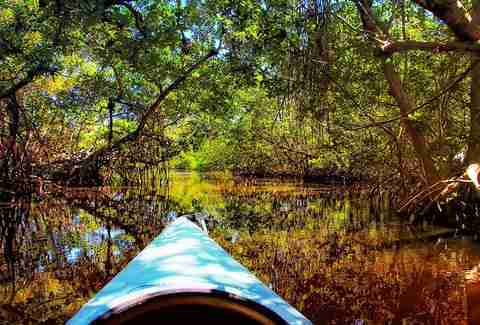 The Estero River is a 9-mile paddle between Lover’s Key State Park and the Koreshan State Historic Site, lined with mangroves growing right out the water and palm trees on the shoreline. In some places, the trees are large enough to canopy over the river -- and what’s more romantic than dim lighting while gliding over the water? Nine miles of paddling a kayak or canoe may sound like hard work, but the payoff from a few hours spent alone, in nature, admiring each other’s upper body strength is sure to pay off. If you get tired, the Koreshan Historic Site is also suited for a picnic, with nine historic buildings on the grounds. 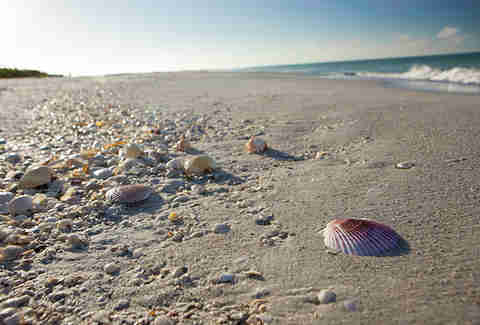 Sanibel is an island off the coast of Fort Myers, and besides having white sandy beaches and killer sunsets, it’s also known for its pastel-colored shells. While they can be found all over the beaches around Fort Myers, Sanibel's position in the Gulf allows it to act like a giant sea shell net. That means you won’t have to lug that unwieldy metal detector to the beach (making a fool of yourself in front of your SO and annoying TSA agents) to find something pretty. Lover’s Key State Park was once only accessible by boat and got its name from aforementioned lovers running off and treating the beach like the far back seats in a dark movie theater. Even though it’s more easily accessible today (you can hoof it on a boardwalk or take a tram) the wild ospreys and dolphins off shore on the two-mile beach still make it feel like a private escape. You can go shelling, swim, or head off to explore the rest of Black Island, which has five miles of hiking and biking trails. Tropical cocktails? They’ve got ‘em right on the beach. 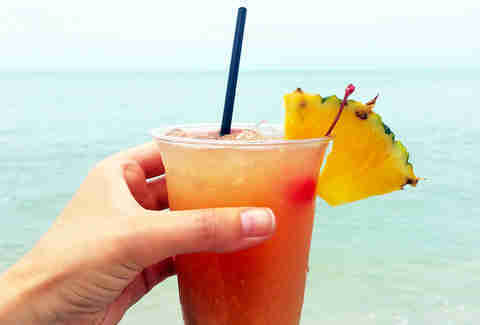 Sometimes, all you need to set the mood is to have a fruity drink in your hand and your bare feet in the sand. Fort Myers and the surrounding islands are full of beach bars specializing in just that, like Cottage Beach Bar -- a favorite local haunt loved for serving up drinks and seafood right on the Fort Myers beach. Yes, right on the beach -- as in, you will be staring at the ocean, working on your tan, and a waiter will hand you a fruity, slushy, umbrella-topped beverage. Another option is the Crow’s Nest on Captiva Island, which, in addition to serving you on the sand, will also give you and your SO the chance to settle your latest debate over live crab racing, featuring hermit crabs and a guy who literally blows a conch shell to start the race. At the Edison & Ford Winter Estates in Downtown Fort Myers, two historic mansions sit on more than 20 acres of gardens, perfect for getting lost in together. 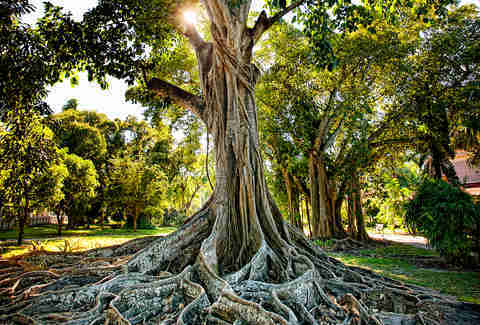 The gardens are home to (possibly) the largest banyan tree in the United States, as well as bamboo, tropical fruit trees, and enough flowers to make it feel like your own Eden. 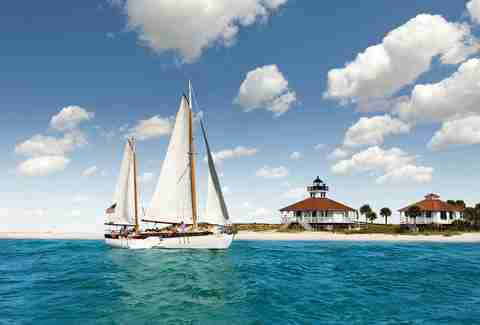 One look at this place will make it clear why “snowbirds” Thomas Edison and Henry Ford called Fort Myers home in those brutal winter months. There’s room for a few lovebirds too. Wall to wall windows line the Mad Hatter Restaurant, offering completely unobstructed views when the sun goes down on this 30-year-old Sanibel Island institution. Life Protip: because there will always be one vacation fight over a dinner, make sure you try and time it for when that sweet orange sunset glows. It also helps that it’s pretty cozy; there are only a dozen or so candle-lit tables, and (of course) a huge Alice in Wonderland mural. And while the menu is always changing, it’s more interesting than the usual seaside restaurant: think black truffle sea scallops and rack of lamb with a walnut cherry pesto. If you head to the beach and don’t spend time on a boat, you’re doing it wrong. We are especially all about boats that require you to board sans shoes, as Magic Winds Adventure Sailing does for their sailing cruises. (Well, you’re good as long as you have boat shoes, but where’s the fun in that?) 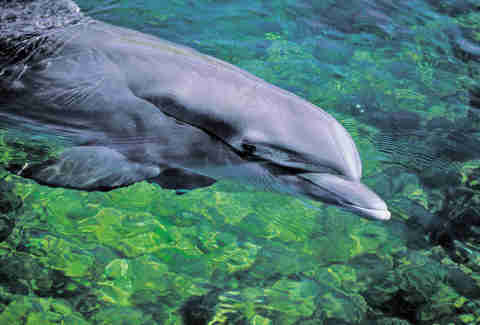 You can opt for either a private sail or go for the slightly more affordable group option. Either way, there’s something about being surrounded by open waters that helps you feel like you two are the last ones on the planet. Cabbage Key Island has no paved roads. There are no cars. There is but a single restaurant and a general store. Other than that, a handful of private cottages exist on the island, surrounded totally by nature. This is “old Florida” in a nutshell -- it’s nearly devoid of any commercialization. When you do get hungry, the open-air Cabbage Key Restaurant is decorated with thousands of $1 bills and is known for its fresh seafood and drinks. Still not private enough for you? 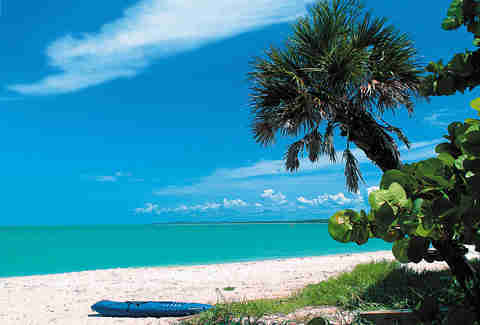 Catch a boat to Cayo Costa, a barrier island with absolutely no development. Lest you forget that Florida is still part of the South, The Veranda will remind you: it specializes in upscale “Southern comfort” dishes like grit cakes with andouille sausage and grilled grouper with a crawfish hash. It serves everything out of a Florida mansion first built at the turn of the century, with original brick fireplaces in the dining room, a large patio with wrought-iron bistro tables and chairs, and palm trees lining the property. After that, you can head over to the downtown’s The 86 Room, a dark speakeasy and jazz venue, where you two can pretend to be perfect strangers meeting for the first time. 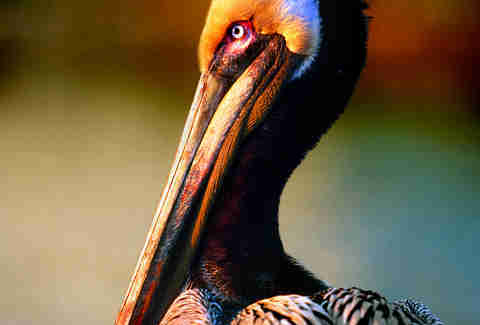 With more than 245 different bird species calling the J.N. Ding Darling National Wildlife Refuge home, you’re going to see tons of egrets, cuckoos, pelicans and Roseate Spoonbills (which will be really upset if you mislabel them as flamingos). You’ll get the chance to spot them as you wander through 6,400 acres of mangrove forests, marshes, and tropical tree canopies -- which is exactly the right amount of acres to make you never want to see a paved road again.